In a normal spine, the head should be suspended directly over the spine. This keeps the weight of the head over the body's center of gravity. The head is suspended not by an inflexible rod, but rather by a curve formed by the vertebral bones in the neck (click here for an example). This curve acts as a shock absorber for our head with every step and jump we make. Sometimes, because of bad posture while reading or doing computer work, from texting or using handheld devices, or because of an accident, or for any number of reasons, a person's posture will change such that their head is shifted forward from a neutral position. Did you know that for every one inch you carry your head forward of your center of gravity, the head effectively weighs ten more pounds? Feel this yourself: hold a bowling ball right next to your shoulders, in front; then, shift it forward. It got heavier, right? This shift in head position means that the muscles of your neck and your upper back will need to work harder to hold your head up. This can cause neck and back pain, and muscle fatigue. Research has shown that blood flow through a muscle decreases as contraction increases, and is virtually cut off at 50-60% of continuous maximal contraction (click here to read abstract). Lack of blood flow results in buildup of lactic acid and other metabolites that cause muscle pain and soreness. Do you always find your upper back muscles fatigued and sore, with massage providing only temporary relief? You may have Anterior Head Syndrome. 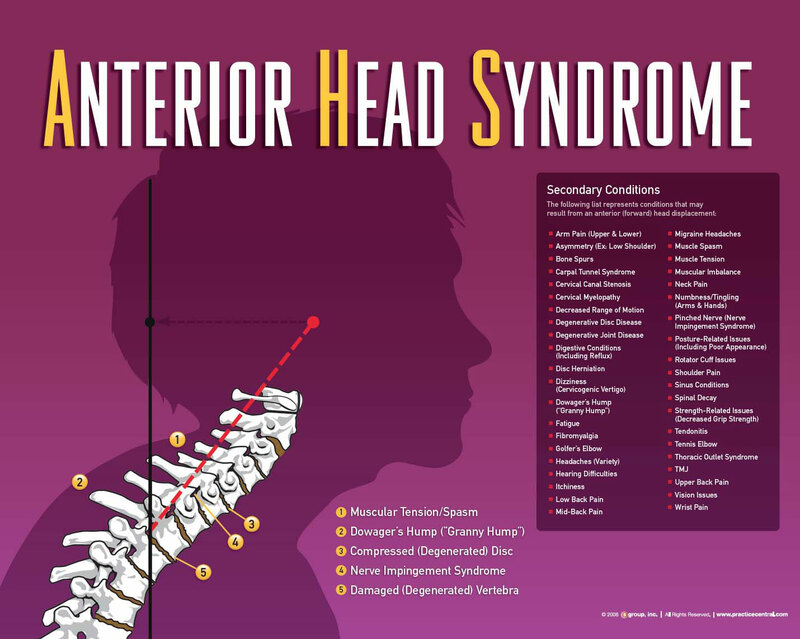 Why is it that Anterior Head Syndrome causes the myriad of health problems listed in the figure above? Well, when the head shifts forward of the body's center of gravity, the spinal column in the neck elongates and straightens. Harrison et al (click here) have clearly shown that loss of the cervical (neck) curve alters the mechanical properties of the spinal cord and nerve roots, which may change the firing patterns of the neurons that comprise these structures . Since the neck contains every neuron that connects your brain with the rest of your body, the spinal cord in the neck is especially important to the function of every organ, cell, and, tissue in your body. A recent paper by Morningstar and Jockers supports this contention, demonstrating that correction of forward head carriage and restoration of the cervical curve is correlated with increase in pulmonary function (click here). Furthermore, loss of the cervical curve has been correlated with multiple health problems; in fact, one study (click here) found that this condition is predictive of mortality in geriatric populations. Loss of the cervical curve also causes unnatural stresses on the vertebral bones in the cervical spine. Wolff's Law of Bone Adaptation states that the body will lay down new bone in an area of stress or strain in order to strengthen it; research has shown that this process results in arthritic bone spur growth in the cervical spine (click here). Anterior head syndrome is a structural shift in the spine that causes stress, and arthritis is one of the many secondary conditions that result from this shift. Lastly, a study by Stemper et al (click here) has shown that spines lacking the proper curve in the cervical spine "enhance the likelihood of whiplash injury and may have long-term clinical and biomechanical implications." Given the number of rear-end collisions every day, having your spine more prone to injury due to lack of cervical curve is a big risk to carry. All technical details aside, the bottom line is this: Correcting Anterior Head Syndrome with chiropractic care is an important step towards restoring and protecting your body's normal structural and functional alignment, and for maintaining optimal health and wellness. Less stress on your body from not fighting to hold your head upright will certainly be good for your energy level; but more importantly, reducing tension of the tissues of your spinal cord and nerve roots will allow your nervous system function at its best.